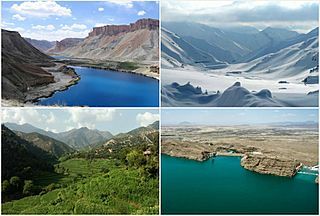 Description: Afghanistan collage, from left to right: 1. Band-e Amir National Park in Bamyan province, 2. The Salang Pass in Parwan province, 3. Korengal Valley in Kunar province, 4. Kajaki Dam in Helmand province.